Berkeley Marina is at 160 University Ave. in Berkeley. Guest docking is on the north side of the marina, adjacent to the boat ramp. Click here for a map of the Berkeley Marina. Bathrooms and showers are available. If traveling North on I-580 or I-80: Take Interstate 80 to Powell St. Take a left under the freeway and right onto the Frontage Rd. Follow the Frontage Rd. to University Ave. Seabreeze Market is on the corner. Take a left onto University toward the Bay. At the first stop sign, Marina Blvd., follow the directions below. If traveling North on I-880: Take the University Ave. exit and the lower/right-hand ramp that goes under the overpass. Take a right at the first intersection Hearst) go up Hearst to 6th St. light) take a right onto 6th and the next right onto University towards the Bay. Go over the overpass and continue straight to the intersection with Marina Blvd, then follow the directions below. If traveling South on I-80: Take the University Avenue exit in Berkeley, which loops around to the right. Take a left onto University toward the Bay. At the first stop sign, Marina Blvd., follow the directions below. Once at the intersection of University Ave and Marina Blvd., turn right on to Marina Blvd. Turn left on Spinnaker Way. The guest docks are accessablee throughthe second parking lot on the left. Find the bathrooms and the boat ramp. The race course is viewable from the end of Spinnaker Way. 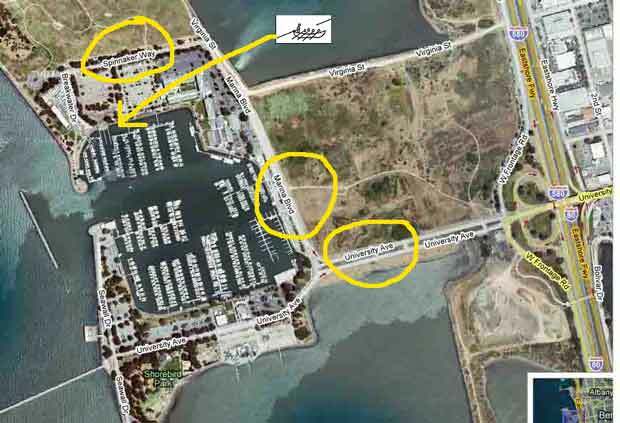 Click here to create your own driving directions to/from Spinnaker Way at the Berkeley Marina. Embarcadero Cove Marina is at Embarcadero Cove (across from 1900 Embarcadero) on the Oakland side of the Oakland Estuary. Parking is free on the street. If Traveling South on I-880: Take the 16th Street exit and turn left on Embarcadero. The Embarcadero Cove Marina appears on the right. When you come to British Marine and Industrial on the right, park and go to the bridge onto the docks. If you've come to Quinn's Lighthouse on the right, you've gone too far. If Traveling North on I-880: Exit onto 23rd Ave and make a u-turn at the first available chance (11th St.). Once over the freeway, turn right at E 7th St. which turns into Embarcadero E. Once you see the water, go past the entrance to Union Point Basin on the left. Cross Dennison (stop sign) and go past Quinn's Lighthouse on the left, until you see the marina on your left. 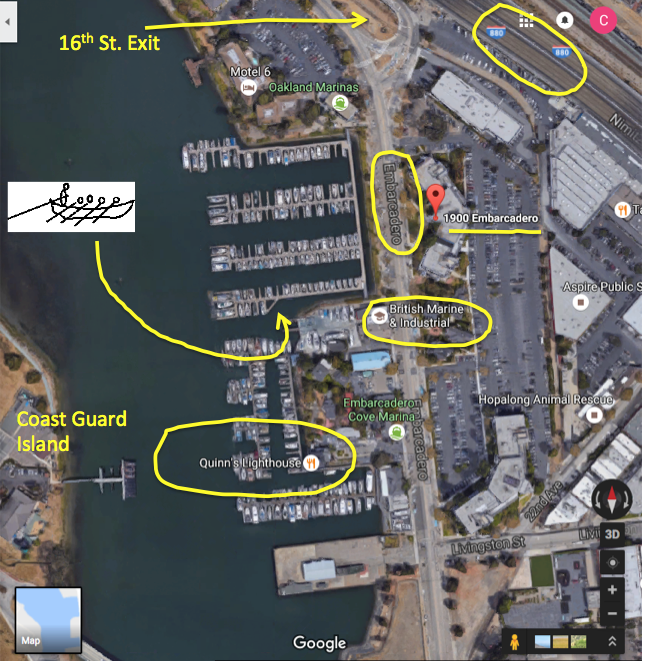 Click here to create your own driving directions to/from our entrance gate at Embarcadero Cove. 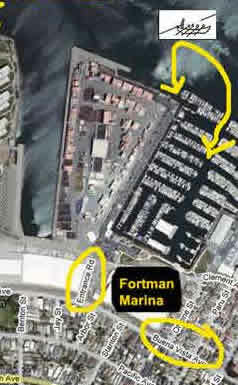 Fortman Marina is at 1535 Buena Vista Ave. on the Alameda side of the Oakland Estuary. If Traveling South on I-880: Take 23rd Street exit (Kennedy), Follow 23rd Street over the Park Street Bridge. Turn right on Buena Vista Avenue, (second light after the bridge). Follow Buena Vista and turn right into the Fortman Marina driveway (just before the large red brick building on the right). On your left is a street sign that says "Entrance" with a faded blue sign for Fortman Marina. Go through the gate and stay to your left, passing the yacht club and the small building with the bathrooms, to the parking area for the docks. If Traveling North on I-880: Take 23rd Street exit. Make a u-turn at the first available chance (11th Street). Go back over the freeway to Park Street Bridge. After crossing the Bridge, turn right on Buena Vista Avenue, (second light after the bridge). Follow Buena Vista and turn right into the Fortman Marina driveway (just before the large red brick building on the right) per the instructions above. Click here to create your own driving directions to/from Fortman Marina. Hyde Street Harbor is at 450 Jefferson between Leavenworth and Hyde, just west of Fisherman’s Wharf. Iron Oars ties up across from the ferry boat Eureka. 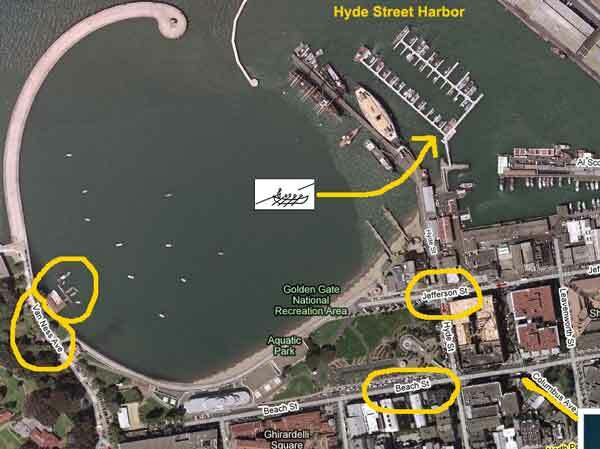 Click here for a map of Hyde Street Harbor. The harbor entrance is at the start of the green arrows. Parking is not available, although you can drive in to drop off people and stuff. Look for street parking or park at Aquatic Park (top of Van Ness Avenue, 4 hour parking) and walk over (5 min.). This area is easily accessible via Muni. You won’t find the street address, 450 Jefferson Street, anywhere on when you are on Jefferson St., which is one-way going west. Turn into the alley between Capurro’s Restaurant and The Bay Company, and proceed to the water and the harbor entrance. Don’t go into the Hyde Street Pier at the foot of Hyde Street, which is one-way going south. The historic Hyde Street Pier (not Harbor) is part of the San Francisco Maritime National Historic Park. A Monomoy would fit with all the historic ships, but that’s not where we are! If Traveling from the South: Take Highway 101 North. Follow the signs to 101 North Golden Gate Bridge. Take the Mission Street exit, and at the bottom of the ramp go right on Mission St. In two blocks go left on Van Ness Avenue, and follow Van Ness Avenue (north) about 30 blocks. Turn right on North Point Street and a left on Leavenworth which dead ends into Jefferson. Turn left on Jefferson (one way) and right into the alley that leads to Hyde Street Harbor. If Traveling from the North/Golden Gate Bridge: Take Highway 101 South to Marina Blvd. Turn left on Bay Street. At Columbus turn left, then right on Leavenworth, which dead ends into Jefferson. Turn left on Jefferson (one way) and right into the alley that leads to Hyde Street Harbor. 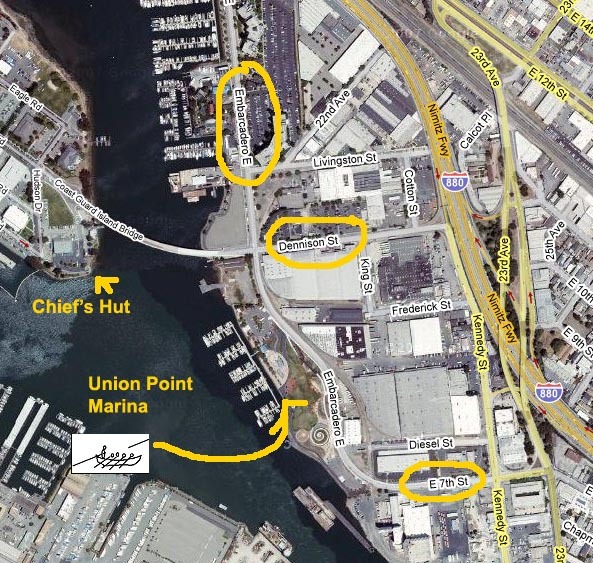 Click here to create your own driving directions to/from Hyde Street Harbor. San Francisco Boat Works is at 835 China Basin Street in San Francisco, south of AT&T Park. Iron Oars will be somewhere in the boat yard. Bathrooms and beer are available. Cars are not allowed in the yard during working hours -- Monday through Friday, 7am to 4pm. Park on the street (unlimited on Illinois south of Mariposa, 2 hour limits elsewhere) when we are moving the boat to or from the Boat Works. However, the yard is open on weekends and into the evening, and tt's OK to park inside the boat yard at those times when attending work parties to overhaul equipment. If Traveling South on 3rd Street: Cross Lefty O'Doul Bridge with the ball park at your back. Go left on Mariposa (3rd stop light) to the intersection of Mariposa, China Basin (A.K.A. Terry A. Francois) and Illinois. The entrance to The Ramp Restaurant is ahead and slightly on the right. The entrance to the boat yard is through The Ramp Restaurant driveway, and left at the top. If Traveling From the South: Take 101 or 280 north and get on 280 north to Downtown. Take the Mariposa Street exit, and at the bottom of the off-ramp go right on to Mariposa Street. Go through the next two lights to Illinois Street. The entrance to The Ramp Restaurant is ahead across the intersection and slightly on the right. The entrance to the boat yard is through The Ramp Restaurant driveway, and left at the top. If Traveling From the North/Golden Gate Bridge: Take Highway 101 South/Golden Gate Bridge to the Marina Blvd. exit. Continue on Marina Blvd. past Fort Mason and turn left onto Bay Street. Continue on Bay ad turn right onto the Embarcadero. Continue on Embarcadero until you pass the AT&T Baseball Park (you are now on King Street). Turn left at Third St. and left at Mariposa. The next intersection is Illinois. The entrance to The Ramp Restaurant is ahead across the intersection and slightly on the right. The entrance to the boat yard is through The Ramp Restaurant driveway, and left at the top. If Traveling From the East Bay/Bay Bridge: Take I-80 West over the Bay Bridge to the first left-hand exit, Fifth Street. Exit onto Harrison Street, then turn left onto 6th Street and continue onto I-280 South. Take the first exit at 18th Street and turn left onto 18th Street. Continue over the freeway to Third Street (first light). Turn Left on Third Street to the next corner (Mariposa) and turn right. The next intersection is Illinois. The entrance to The Ramp Restaurant is ahead across the intersection and slightly on the right. The entrance to the boat yard is through The Ramp Restaurant driveway, and left at the top. 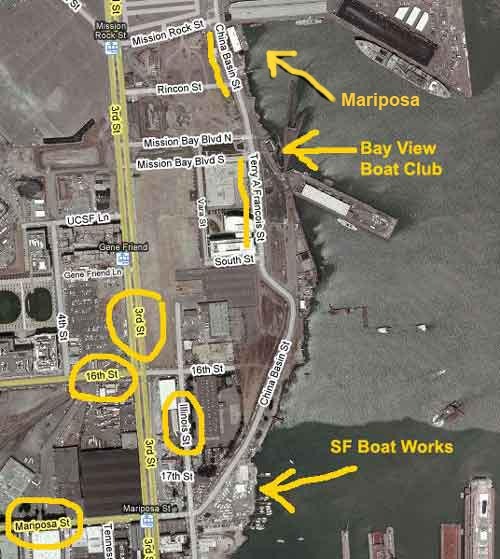 Click here to create your own driving directions to/from the San Francisco Boat Works. South Beach Harbor is located at Pier 40, Townsend and The Embarcadero. It is south of the Bay Bridge (as are all even-numbered piers in San Francisco). Click here for a map of South Beach Harbor. Parking is available at Pier 40 for short periods of time without a pass. 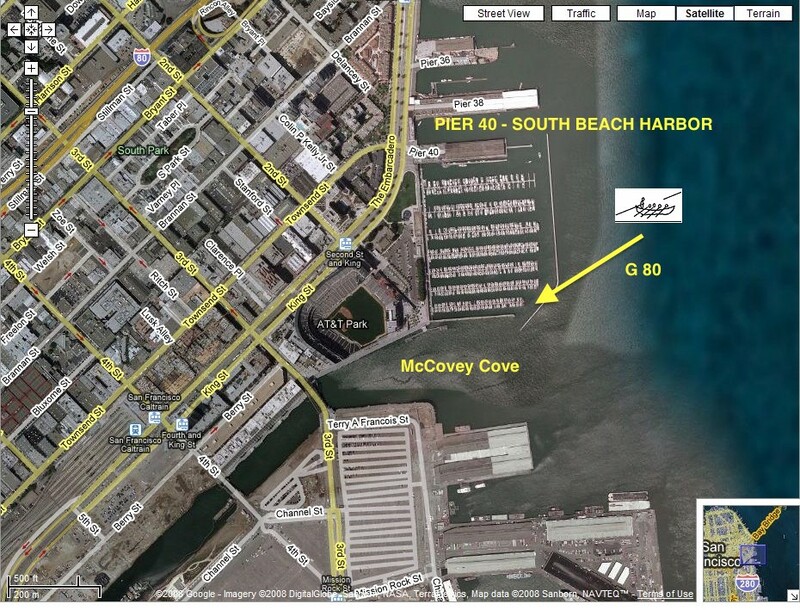 Pier 40 is about a 25 minute walk from Market and The Embarcadero. It is easily accessible via public transportation. Walk to the McCovey Cove end of the marina. Iron Oars is in G80. If Traveling from the South: Take Highway 101 North to I-280 and exit at the “Last SF Exit,” 4th St. Continue on King Street as it becomes Embarcadero. Turn right at Townsend and the Embarcadero onto Pier 40. If Traveling from the North/Golden Gate Bridge: Take Highway 101 South to Marina Blvd. Turn left on Bay Street and right on Embarcadero. Pass under the Bay Bridge 1/2 mile, and turn left on Townsend into Pier 40. If Traveling from the East Bay/Bay Bridge: Exit I-80 at the first left exit over the bridge, Fifth St. Turn left on Fifth St., left on Townsend, then continue on Townsend across the Embarcadero into Pier 40. Click here to create your own driving directions to/from Pier 40/South Beach Harbor. Union Point Basin is on the Oakland side of the Oakland Estuary at 2301 The Embarcadero. This is about 2 miles south of Jack London Square. Parking is free in the Union Point Basin Parking lot. Please be courteous to the residents who park there too. If Traveling South on I-880: Exit at 23rd Ave. (also marked at street level "Coast Guard Island") and take a sharp right onto Dennison St. The first stop sign is at Embarcadero E., where Dennison St. turns into the causeway to Coast Guard Island. Turn left, and the entrance to the Union Point Basin parking lot is about 50 yards on the right. If Traveling North on I-880: Exit onto 23rd Ave and make a u-turn at the first available chance (11th St.). Once over the freeway, turn right at E 7th St. which turns into Embarcadero E. Once you see the water, the entrance to Union Point Basin will be on your left. Click here to create your own driving directions to/from Union Point Basin. Vallejo Marina is located at 42 Harbor Way in Vallejo. The guest docking information is provided in the race packet. If traveling North on I-80: Immediately after crossing the Carquinez Bridge, take the first exit on the right (it comes up fast) onto Sonoma Blvd./29. After about 2 miles, turn left on Mare Island Way (called Curtola Parkway on the east/right side of Sonoma Blvd.). You will pass the Vallejo ferry docking area and Ferry Terminal on the left, and soon see the marina ahead on the left. Turn left at Harbor Way. Alternate route: Once over the Carquinez Bridge, take the I-780 exit toward Martinez/Benicia. Keep left at the fork, follow signs for Vallejo and merge onto I-780 W. Continue on Curtola Parkway, which turns into Mare Island Way. You will pass the Vallejo ferry docking area and Ferry Terminal on the left, and soon see the marina ahead on the left. Turn left at Harbor Way. 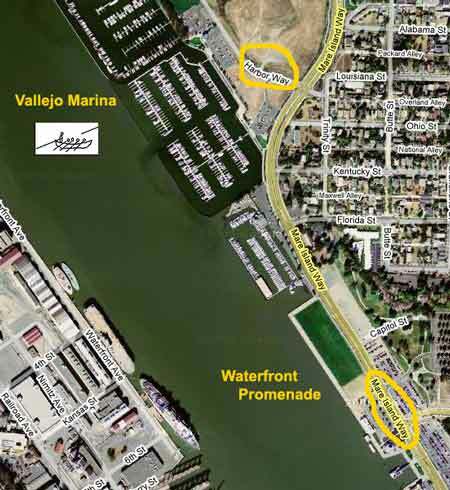 Click here to create your own driving directions to/from the Vallejo Marina.